Anyone from the UK looking for the signed picture that went out in SMF orders? And wants to do some fund raising at the same time? Were you too shocked to read "with the SMF orders" Megs? No I did read that, but I think what I meant was, where was that ordered from. 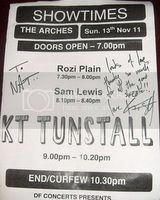 Some of the people who pre-ordered from recordstore.co.uk got a signed photo. If you preordered from recordstore, 50 random people get a signed photo I think. Anyone else noticed a LOT of KT tshirts on ebay? Just won one and bid on another, they've got the US tshirts from 2006. There are a lot actually. Which ones did you get Nat? I won that first one and bid on the second. 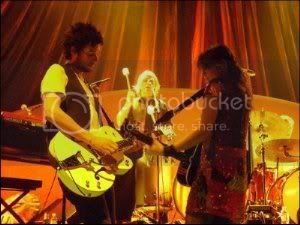 They are real, from the american tour in 2006. I remember someone posting them on the forum and I was like "wow have to get those" but that was the days before the online store. I do like the red one with the spaceman on actually, it's quite nice and simple. I have that one but its more a vest top. I remember being round at Stephen's one night and he went to change the cd that was on and it has her name at the neck and he saw it when he walked behind me and was like "Nat..is that a bloody KT tshirt?" Said the one time top poster on the forum! I really like that vest top.